Candidates looking for NIMCET Notification 2018 - Important Dates & Eligibility Criteria | MCA Entrance Exams 2018 have a good news as the notification will be out soon. So all the candidates looking to take admission for MCA can now will be soon able to aply for the entrance exams. So kindly read the complete article to know more in details regarding the NIMCET 2018. Al large number of candidates around the country apply for the exams and then get the admissions for the MCA in their respected colleges.So all the eligible and interested candidates can apply for MCA entrance exams 2018. National Institutes of Technology (NITs) have released a notification for the admission into MCA programme through NIT MCA Common Entrance Test (NIMCET 2018). All candidates who want to pursue MCA (Master of Computer Application) from one of the reputed NITs may check the eligibility criteria and apply online from 20-02-2018 onwards and send a hard copy of online application on or before 31-03-2018 till 3 PM. 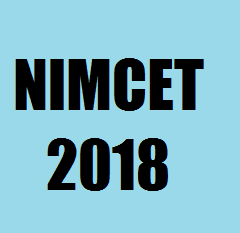 NIMCET is a National Level Entrance Test is conducted by NITs for admission to the MCA course offered by NITs (National Institute of Technology) at Agartala, Allahabad, Bhopal, Calicut, Durgapur, Jamshedpur, Kurukshetra, Raipur, Surathkal, Tiruchirappalli and Warangal for the year 2017-18.
i. B.Sc./B.Sc. (Hons)/BCA/BIT of minimum three years full-time with Mathematics/Statistics/Equivalent subject from a recognized University. ii. B.E./B.Tech. or equivalent from a recognized University are eligible to appear for NIMCET-20I7. How to Apply Online: Interested and eligible candidates may apply online through http://nimcet2016.nitdgp.ac.in/ website from 20-02-2018 to 20-03-2018 and send a hard copy of online application along with relevant documents to The Secretary, NIMCET-2018, National Institute of Technology Durgapur, Mahatma Gandhi Avenue, West Bengal -713209, on or before 31-03-2018 till 3 PM. So this was all about NIMCET Notification 2018 - Important Dates & Eligibility Criteria | MCA Entrance Exams 2018. Hope you liked the article and have applied for NIMCET 2018. Kindly comment down your views or any doubts will get back to you as soon as possible. Feel free to give your views regarding NIMCET Notification 2018 - Important Dates & Eligibility Criteria | MCA Entrance Exams 2018.